Eco Friendly Destination Weddings in Pune and Goa that Inspired Us! In the wake of World Environment Day, we’ve put together three Real Destination Weddings that helped us see the bigger picture. These couples decided to deviate from the norm and organized their weddings in picturesque nature-filled spaces with full focus on the love. Their green destination weddings were best way to go + stress-free wedding planning process + no random people at your wedding +no waste of money on unnecessary things. 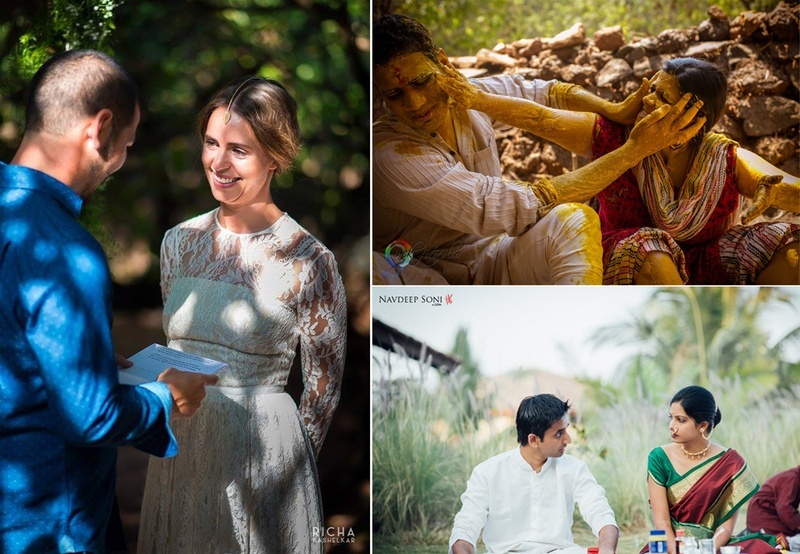 The three destination green weddings had minimal, DIY décor and outfits that were the perfect definition of elegance – these couples really showed us how to save lakhs, crores even with their simplistic inspirational weddings. Pradnya and Mayur decided to get married in the rustic green konkan at a heritage eco-resort popularly known as Mamach Ghar. Nestled in a cosy little place called Tural, Konkan, their wedding was the ultimate translation of a minimalistic green wedding in India. No blazing lights, fancy drapes or extravagant décor – Pradnya and Mayur had the setting sun as their backdrop, and a tiny mandap with simple drapes. They didn’t feel the need for majestic décor setting but simply let nature do the talking. When millions are spent on lighting, décor, food, this beautiful couple chose to have nature do all the talking at their memorable and inspiring wedding ceremony. They truly spearhead the ‘Green Wedding Movement’. A humble, earthy wedding ceremony that proves that nature's grandeur can put any glamorous wedding decor to shame. We love that Neha and Kunal took the no-stress process, where confusion between chivari and folding wooden chairs, and lilac and lavender didn’t cause tiffs, but all that energy was directed on the love. This two-day destination wedding was held in the clean, green abode of Malhar Machi, Pune where this couple took their Saat Pheras. It was a typical Puneri Maharashtrian wedding with a total strength of eighty people only – talk about changing the Indian wedding scene! We adore the closeness and intimacy of Neha, Kunal and their families; it definitely made this marriage celebration all the more special. A backyard wedding? In India? That happens? We can probably credit this style of marriage to the fact that neither the bride nor groom were Indian. We’re pretty sure, if it was an Indian wedding, it probably would have 30 people even if the couple eloped! But as for Opal and Ollie, everyone present added up to a number of sweet sixteen which included the uber chill bride and groom. The nuptials were held in a backyard under a lush green tree with a bamboo frame for an altar. Ollie looked like a vision in white in her laced high-low wedding dress. With minimal makeup, a delicate maangtikka and no footwear. Scrolling through these pictures we’re positive you will want to save these to your pinterest board only for the prettiness. Whether it’s the fully DIY dinner table or the simplicity of her blue hued bridesmaid dress – every element of this rustic wedding was oh-so-pinterest worthy!